Again, the word ‘saras’ means ‘essence’ while the word ‘swa’ means self. Thus it gives the meaning the essence of self. As Goddess Saraswathi is depicted as the consort of Brahma, it symbolizes that knowledge and creation are in harmony. Goddess Saraswathi is considered by the Hindus as the mother of the Vedas. She is the Goddess of knowledge, education, music and arts. Accordingly she represents the free flow of wisdom and consciousness. She is portrayed as seated on a lotus flower within a lake with a swan nearby and with four hands and dressed in white saree. The lotus symbolizes eternity, purity and divinity. Her four hands symbolize the four directions of the world and that the mother goddes is present all over all the time .The two front arms signify her activity in the physical world – the front right hand represents the mind while the front left hand represents the intellect. The two rear arms signify her presence in the spiritual world – The rear right hand represents the ego while the rear left hand represents the conditional consciousness. The left side of the body symbolizes qualities of the heart, while the right side of the body symbolizes activities of the mind and intellect. 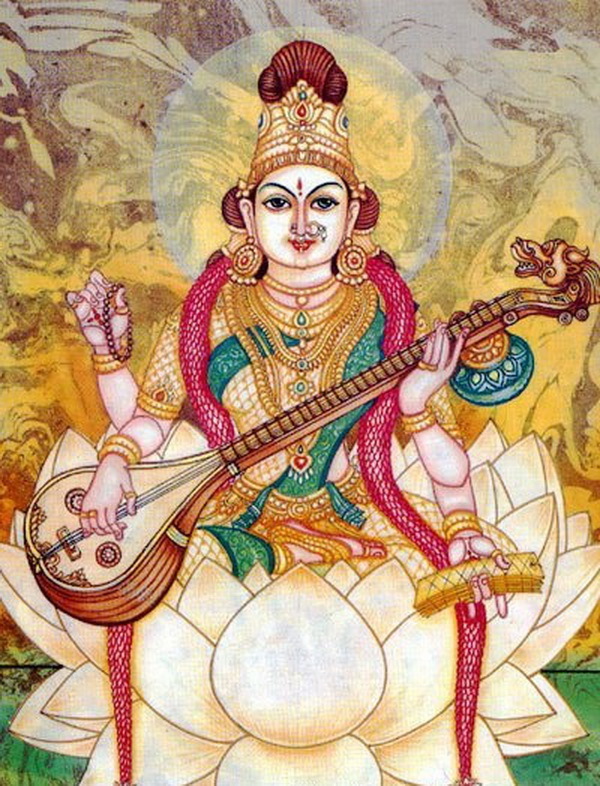 The Depiction Of The Veena With The Sastra In One Hand And Japa Mala In The Other – Depicts Philosophically – Music ( Veena) With Devotion ( Japa Mala ) And Satsric Knowledge ( Book In Hand ) Leads To Moksha [Liberation]. Against such a background, it is essential to analyse the function of every hand which hold specific items. She holds a SASTRA with her rear left hand. This is symbolic of knowledge and intellectual excellence. It also signifies that acquisition of such knowledge should be utilized for the benefit of mankind. Knowledge is everlasting and cannot be diminished. She holds a JAPA MALA rosary with her rear right hand. This symbolizes concentration, meditation and contemplation leading to union with God. This symbolizes meditative process in the acquisition of knowledge. Her front hands hold a Veena with which she plays the music of love. This symbolizes mind and intellect. The front left hand on the top of the Veena closer to the heart represents the intellect. This conveys the message that an individual must tune his mind and intellect if he were to live in perfect harmony with the world. Such harmonious living enables an individual to utilize the acquired knowledge for the benefit of the entire mankind. In the story of Mahishasura, since he failed to utilize the acquired boon he was instrumental for his own destruction on account of his egoism. The front right hand on the bottom of the Veena represents the mind and demonstrates that negative knowledge should be kept under control. The Veena demonstrates the potential for the negative and positive purposes of knowledge. The Veena points to the collective sound of all our thoughts and actions as it is manifest as music in the cosmic universe – it makes the withdrawal of the senses and the focus needed to attain knowledge. Goddess Saraswathi is the mother as embodiment of Knowledge, depicted in pure-white saree, symbolizes the illumination of the Supreme Truth. Knowledge cannot be destroyed and will last forever and will always lend a helping hand. behaviour, as its moods can be influenced by the change of weather. Therefore the peacock symbolizes arrogance and pride over its beauty. This is the reason why Goddess Saraswathi has not preferred to choose peacock and preferred swan as her vehicle. This sends the message that an individual should be calm, fearless and not fickle minded if he or she were to acquire true knowledge. She is not concerned with external appearance. Moreover, the bird Swan in Sanskrit is called Hamsa. Hence, Goddess Saraswathi is referred to as Hamsa-vahini when she uses the swan as her vehicle. Finally, it can be observed that Goddess Saraswathi is adorned with less jewels and gold and rich clothes and this sends the message her preference towards knowledge over worldly material things. Therefore, it is time to realize the symbolic messages of Navarathri, as the celebration is a call to the higher mind, the beginning of a deep desire to understand the purposes and meaning of life and not to engage in destructive practices. I am not an expert on sanskrit to comment, but still I will make an adventure. As per Swamy Paramarthananda (discourse on saraswathy ashtakam) I will send the link later, it is “sarasa ithi vasathi” is saraswathi. (staying in a lake). Saraswathy Temples are also constructed like. Knowledgeable article. Thank you so much for the details. ‘Veena symbolises mind and intellect’ – I read in a book of Gayathri Devi that human spinal cord (with 24 bones?) is like veena. I could relate the two and feel how beautiful the thoughts are! Visit this page to know more about Maanushi Veena and Daiveeka Veena. Thanks for the link! Will definitely go through.